This time my family is affected by the recent recall by Mattel. There will be tears in our household today, as toys Grandpa bought my daughter are included on the list. The concern is powerful magnets that can be swallowed and cause major damage. All affected toys were made in China. Another recall occurred earlier for Mag Stix Magnetic Building Sets, as serious intestinal injury can occur from swallowing these powerful magnets. This was another toy we had in our home. A child living relatively close to our home suffered major injuries from swallowing loose magnets. “Extensive surgery was required to remove the magnets and repair intestinal perforations,” according to the CPSC. Magnets are very cool for children to experiment with, but safety should always be the concern of toy manufacturers. There are plenty of wonderful ways for children to explore the properties of magnet forces with larger products that do not cause harm. Hearthsong offers a great magnetic toy, that is appropriate for older children or with close supervision for younger ones. The Deluxe Magnet Set includes “a giant horseshoe magnet powerful enough to lift up to four pounds! 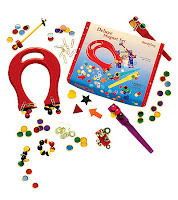 Also included are two mighty magnetic wands, 20 magnetic marbles, 50 circular transparent discs, colorful paper clips, metal bolts and washers, 4 colorful magnetic shapes, and 3 magnetic discs.” It is on sale now for $17.99! 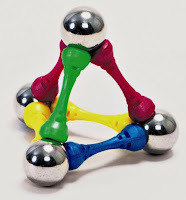 The magnetic marbles and magnetic discs could be swallowed by a young child (there are other parts that could be swallowed too, but they are not magnetic), thus the toy is recommended for children four years and up. We have this toy in our preschool; however, I only allow children to request to play with it when there is supervision available. The CPSC lists magnets at the #1 hidden home hazard. They warn, “Since 2005: 1 Death, 86 Injuries; 8 million magnetic toys recalled. building sets that contain magnets have also been swallowed by children. not treated properly and promptly. We are busy packing up our Dora and Diego toys for shipment back to Mattel – we received the postage-paid mailing label via email and haven’t encountered any problems with the process…yet. Wonderful post on this recall. Though we have so few licensed toys, I wasn’t too concerned about the recall, I have begun to worry a bit about our magnet toys. We have a “magnet basket” filled with some Magnetix building sets and other various magnets I’ve picked up in dollar bins. Though at 5, my DS is presumably old enough to know not to swallow the magnets, we still felt it was important to discuss the issue with him and keep them out of the playroom in reach of younger children who may come to visit.